Iriving "Fan of the Arts" sent this picture. 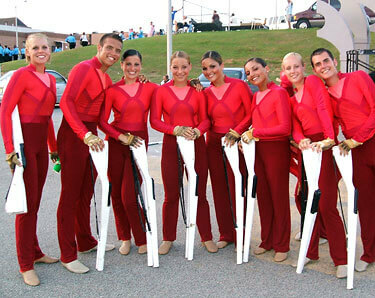 I have been involved with the drum corps activity for what I like to think is a long time. I started marching with a local corps from New London, Conn., in the late 1960s called the Surfers, and I aged out in 1976 with the 27th Lancers. I was on tour with the Cadets this past summer when I took this picture of the Boston Crusaders' rifle line before they took the field. It was early in the season and just like the Cadets -- Boston had some props to lug onto the field. The rifle line still managed to give me some time to take this shot. What a summer!